Dokku lets you setup Rails hosting infrastructure on a simple VPS without much dev ops experience. Although it is easy to get started, a default config might result in very slow and unreliable deployments. In this blog post, I will describe how I’ve improved my Dokku based Ruby on Rails (NodeJS with Yarn and Webpack) application deployment speed by over 400% using a Docker image Dockerfile. This tutorial is written in the context of RoR tech stack but solution presented (with small Docker image config tweaks) can be applied to all the server side technologies hosted with Dokku. If you are not familiar with Dokku, you should check out one on my previous blog posts to get up and running quickly. Once you have a simple Rails app hosted on buildpacks based Dokku setup, you can follow rest of this tutorial to significantly reduce deployments speed. But first, let me explain why default Dokku deployment tends to be so slow. Every non-trivial Rails app has multiple system level dependencies. Dokku provides support for them using so-called buildpacks, the same approach that Heroku is using. I was also using Chrome Puppeteer buildpack for a moment but eventually switched to Browserless.io on a separate CPU optimized VPS. But why buildpacks are so slow? Apparently by default buildpacks are not too smart about caching and every single deployment downloads and recompiles some of the application dependencies. No wonder it is slow, and probably not the best way to use your application’s VPS CPU and RAM. What’s worse buildpacks based builds sometimes randomly fail due to 3rd party connectivity issues and network timeouts. There is an alternative solution. 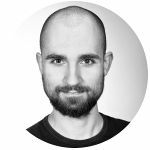 You can use a custom Docker image instead of multiple buildpacks. The official Dokku documentation mentions it very briefly and describes as a "Power User" feature. In practice it’s just a matter of adding one config file and running a couple of bash commands. Switching to Dockerfile reduced deployment time of Scraper App from over 8 minutes to less than 2. I will explain how to set this up for a sample Ruby on Rails app using Ruby 2.5.1, NodeJS 8.x.x LTS with Yarn 1.9.4. Copying Ruby gems and node modules files to /tmp, effectively caches them reducing deployment time. In practice assets precompilation takes ~90% of deployment time. 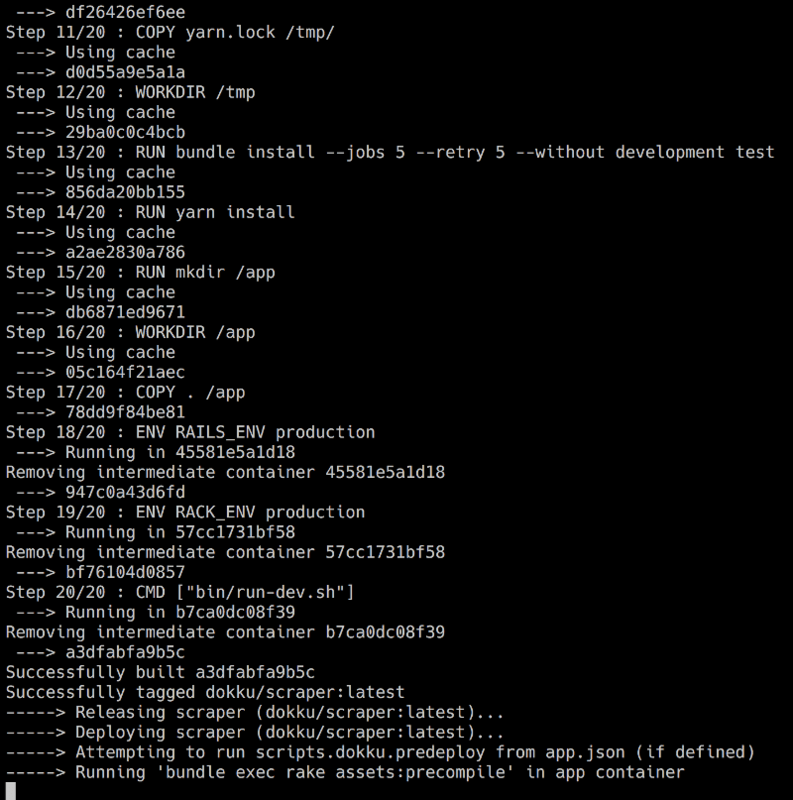 All the Dockerfile steps are cached and executed almost instantly after the initial deploy. You could also build and publish Dockerfile image yourself but that’s outside the scope of this tutorial. ENV variables defined by dokku config:set command are not available during Dockerfile based deployments build time. bundle exec rake assets:precompile predeploy step will launch your Rails app process, and things could fall apart if some of the required ENV variables are missing. It’s not a perfect solution because requires you to duplicate config but works for my use case and must be done only for nonoptional variables. Playing directly with Dockerfile images is a bit lower level than using a default Dokku buildpacks based approach. 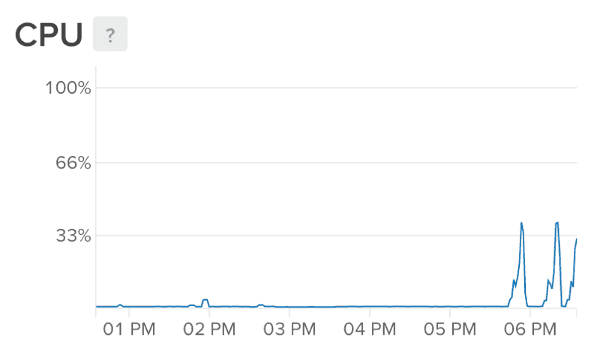 For me, the speed and reliability of Dockerfile powered deployments was more than worth the effort.